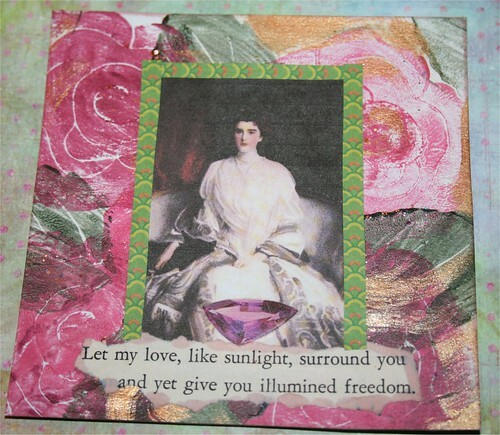 Let My Love 4" x 4" Collage Card, originally uploaded by DianthusMoon. This was fun to do, especially after having a day when my eyes and sinuses were aching from the very dry conditions here in Pennsylvania. The weatherman said it’s only 16% humidity with low dew points. And it’s in the 60s during the day. I had a tub full of different glazes and stampers-remember that fad from about 14 yrs ago? I think Plaid is the one that came out with them. The glaze is still good! You paint it on the stampers and press on paper. I hand painted some gold in. The verse is from a book from 1946 and the lady is one of a few I scanned from an old book. Spent some time this morning ripping out my DaVinci lady’s right eye! Ugh! For some reason I counted over from the middle and left a space. It’s almost fully repaired now. Sean and I went out to lunch and then to a fresh market place similar to Trader Joe’s but more expensive. We didn’t purchase too much, just a few veggies and mushroom ravioli that Bri and I had for dinner.